On Nerd Camp eve, it seems only appropriate to share my list for Mock Newbery 2018. Although, I've not read all the books yet on my list, I've read most and I can say, I'm really excited about sharing these 18 titles with my new fifth graders! I haven't joined in the #IMWAYR in a while, so I thought this would be a great way to wrap up some amazing reads that I finished in June! A big focus this month has been on Mock Newbery contenders. I try to read as many of the books as possible so I can be a better book talker to my students (and of course be able to make my own predictions.) I'm also throwing myself into as many picture books as possible so that I can hit the ground running with #classroombookaday next year. You can see all my picture book reads and reviews on goodreads. 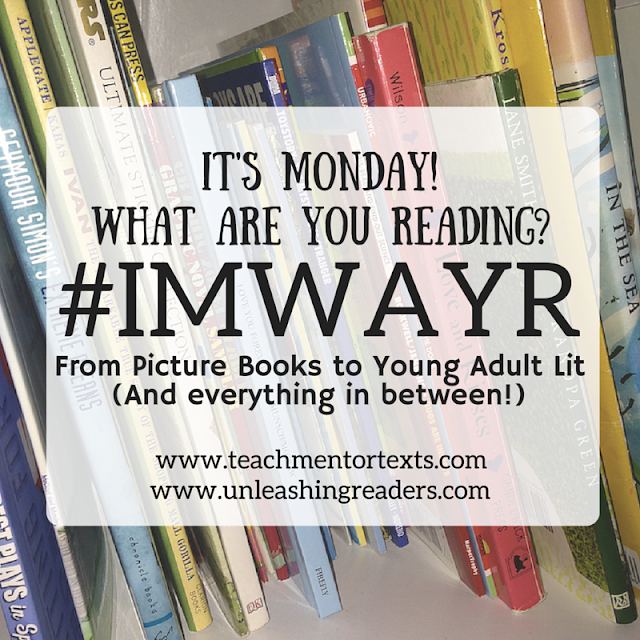 I'll focus on middle grade books for this post! This diverse collection of short stories is a must for any middle grade classroom! I enjoyed listening to this book as a audio because each story was read by a different narrator. It kept the book moving forward and made the stories come to life. Kwame Alexander and Matt de la Pena had two of my favorite stories along with author Grace Lin. Many of the stories tackle issues that kids can relate too including stereotypes, fitting in, and finding your own way. You won't be disappointed in this collection and it'd be a perfect fit for the Reading Without Walls Challenge. Grades 5+. This story and the cast of unforgettable characters captured my heart! Carter Higgins has created a fantastic read that will have you craving sweet potato fries and hot dogs. Everything is better at the ballpark and this story is no exception! Students will instantly connect with Derby and her love of all things food, family, and fun! From helping out a friend in need to training turtles this book has it all. Lots of great discussion to be had about losing a loved one and how friends and family can help you move on. On my #MockNewbery list for 2018. Grades 4+. I have so many mixed feelings about this novel. I had heard some great things and read stellar reviews on goodreads, so I knew I had to pick up a copy. I'm glad I've read this book and was able to journey with Rydr as she comes to grips with loss, love, and life as she makes her way to an uncle she's never met. The writing is fantastic! However, I think School Library Journal and the author are a little out of touch with middle grade literature. This is NOT a middle grade novel in my opinion. From the Ginsberg references to the drug/relationship inferences - I'm not sure any 5th or 6th grade will fully comprehend the author's intent. I also was left without much hope for Rydr because her future was so uncertain. While I'm not saying the ending should be perfect - most MG books leave the reading feeling a sense of hopefulness for the future. I didn't get that feeling. I see this more of a YA book for 7th and 8th grade students. I believe that more books need to confront the drug problem we're facing in today's world but I'm not sure this is the book for younger students. Grades 7+. Jen Maschari's newest book Things That Surprise You does not disappoint! I fell instantly in love wiht Emily Murphy and connected with her struggle to navigate the difficult world of middle school, divorce, and feeling like you matter. Emily's story is a must read for any middle schooler and Jen's own personal connections to the story make the story shine. It's realistic and true and students will appreciate some "messy" truths about life as a young adult. I read this book in just under 24 hours because the writing and story were so well crafted. You'll want to preorder this August release for your classroom or Mock Newbery book club. This title is definitely on my #MockNewbery 2018 list. Grades 4+. Izzy Kline has butterflies about starting fifth grade and auditioning for the school play. She's also worried about friends and fitting in. Told in verse and through "small moments" in Izzy's life, this story is a fast read that students will love! Izzy's life is heart-warming and easily relatable to any one that's tried to set outside their comfort zone. Grades 4+. Is it too early to say this is a Newbery contender? This story instantly took me back to my first time reading The Giver in 6th grade. The world that Laurel Synder has built is magical and realistic -- so much so you'll never want to leave Orphan Island. The characters and setting make for a wonderful tale of nine children thriving on an island. This story captured my attention from the first sentence to the last period. I read this book in 2 days trying to savor the ending. I've seen some mixed reviews about pacing online - but I felt the story flowed as you witness first hand the blurred lines between childhood and young adulthood. Jinny's story is one that many students will want to read again as they try and put together the puzzle that is Orphan Island. So many questions and metaphors, this book kept me thinking even after the last page. A must have for middle grade dystopian and fantasy lovers! On my Mock Newbery for 2018. Grades 4+. Currently, I'm reading Hello, Universe & listening to the audiobook for See You in the Cosmos. What's your list for July?